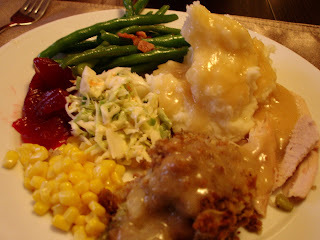 Thanksgiving is my favorite holiday because of the food! Everything on your plate is comfort food...my favorite kind of food. - I made my first turkey! Well, I've made one before, but this time I took care of cleaning and prepping it as well. I rubbed it with butter, salt, and pepper, stuffed it with stuffing, and put it in a roasting bag with onions, carrots, and celery. - Jon and I made stuffing following a recipe Jon's mom's always made, a very traditional stuffing of bread, celery, onions, and lots of good spices. We cooked half of it inside the bird and baked the other half in a dish. - My mom brought cole slaw made exactly how her mother always made it. When I was little my grandmother would make a bowl of cole slaw for me without the mayonnaise. That was the only way I'd eat it! Now I love it the traditional way. 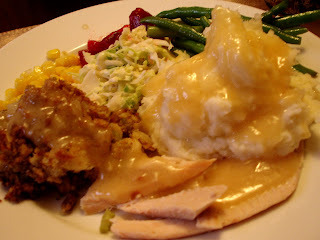 - My dad made the mashed potatoes (he's the master of the mashed potato!) and a sweet potato casserole. Of course he gave one beater to me and one to my sister, just like we used to do when we were younger. - Jon whisked up some turkey gravy - his mom taught him how to do it several years ago and now he's a gravy expert. 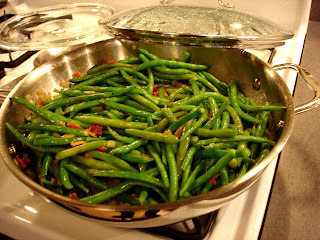 - I added one new recipe - green beans with bacon and shallots. I made it once before and thought it would be perfect for Thanksgiving dinner. 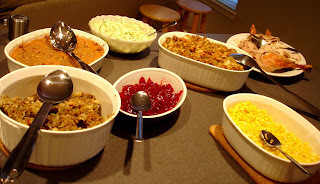 - And of course we had your traditional rolls, corn, and cranberry sauce (yikes, yes, that's the canned variety!). - My sister's contribution was cleaning everything up - thank you!!!! That's the part I hate the most. Look at all this food - and this is only some of it! Since most of the recipes are family recipes, I feel funny posting their secrets. I will however post the green been recipe. I found the original on allrecipes.com and have since made some changes. Cook pancetta (bacon) in a large skillet over medium-high heat until crispy, then set aside. Reduce heat to medium, stir shallots into the pancetta (bacon) fat, and cook gently until the shallots have turned dark golden brown, about 10 minutes. Place pancetta (bacon) and green beans in skillet; toss and cook until warmed through, about 2 minutes. The desserts were fabulous and if you know anything about me, you know I didn't make them! My mom made pumpkin pie and my dad brought Jon's favorite, Jewish Apple Cake. Both desserts were also specialties of my mom's mom. Looks so bright and fresh!Yum! I made these for the first of our Christmas dinners today--rave reviews! Thanks for the idea.